Mozilla revealed yesterday that it plans to enable multiple content processes in Firefox Nightly, the cutting edge development version of the web browser. Firefox's multi-process architecture is not yet enabled for all users of the stable version of the browser, currently on version 49.x, but plans are already underway to improve multi-process Firefox. Mozilla's initial version of Firefox's multi-process architecture used one browser process and one content process. This is different from Chrome's implementation which uses one process for each content process instead. This is one reason why Chrome uses more memory than Firefox (you can reduce Chrome's memory hunger a bit by using one process per site). One disadvantage of using one content process for all sites is that a bug in one may take down the whole process. Since there is only one, it may crash all sites open in Firefox. While that should not affect the browser core, as it runs in its own process in multi-process Firefox, it is far from ideal. Load about:config in Firefox's address bar. Confirm that you will be careful if a warning prompt is displayed. The value of the preference indicates the number of content processes. The value you see there is the number of content processes that Firefox may use at most. 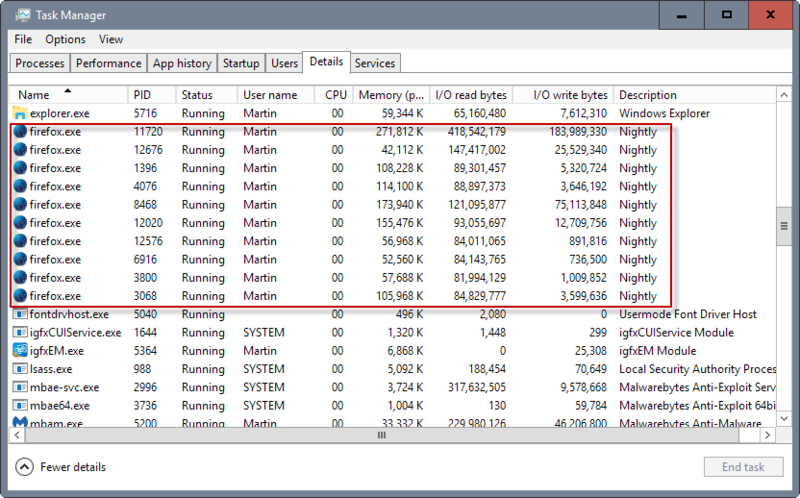 If you check the Task Manager, you should see value+1 firefox.exe processes running (the +1 is the browser process). You can change the number of processes that Firefox uses by changing the value. I have run Firefox Nightly with eight content processes for the past months and never ran into any issues. You should expect a higher RAM usage of the browser due to the number of extra processes and overhead, but if you have plenty of RAM, that is more than made up for by increased stability and performance. Bugs are to be expected, and there are already some that Mozilla is working on. DOM Storage for instance does not properly propagate between processes which could cause some sites to misbehave. The change will land in Firefox 53 Nightly, but multiple content processes won't be part of Firefox 53 Stable. It is unclear yet when this is going to happen. You can follow the meta bug on Bugzilla@Mozilla here. Multiple content processes is the way to go, but it will take a while before stable users will benefit from those (unless they enable them manually). I cannot way to get proper security sandboxing added to Firefox, a feature that it desperately needs to close the security gap to Chrome. Now You: are you using multiple processes in Firefox already? … and was backed out. It will land again next week, after the merge of Firefox 52 to aurora, so it will be enabled in Firefox 53 Nightly. Thanks Sören, I’ll update the article. I’m always kinda amazed by this argument “when one tab crashes the browser crashes”. I have lots of addons, I have hundreds of open tabs and I cannot remember the last time one tab crashed the whole browser. And even if, for a normal user with like a handful of tabs, FF will restart and restore in a couple of seconds. Only problem is that around 8-10 GB of RAM usage, FF gets slow and unresponsable, most like because of some JS crap from websites in the background I guess. How does FF decide what tabs to put in what process? Does it group all tabs from one site in one process or can it split one site into several processes (I have like 50 tabs for only one site open at the moment). Do you have the link to the bug on bugzilla Martin ? Mine has enabled this after Noscript updated to the latest version. Immediately after Noscript updated and enabled multi-process, loading sites is very noticeably slower (not by a little either, even opening a new tab will sometimes hang with a spinning wheel often) and is using significantly more memory. Not 10-20% more. And this is with one tab open and 2 extensions. 600K just opening the browser and this one site when that used to take closer to 400K. Add in Youtube, pushing 800K. Add Amazon and open a couple product pages. 1 GB. Flash content seems like it approaches well over 50% more than it used to conservatively. 4 GB memory will suddenly be an issue for users when it wasn’t before.